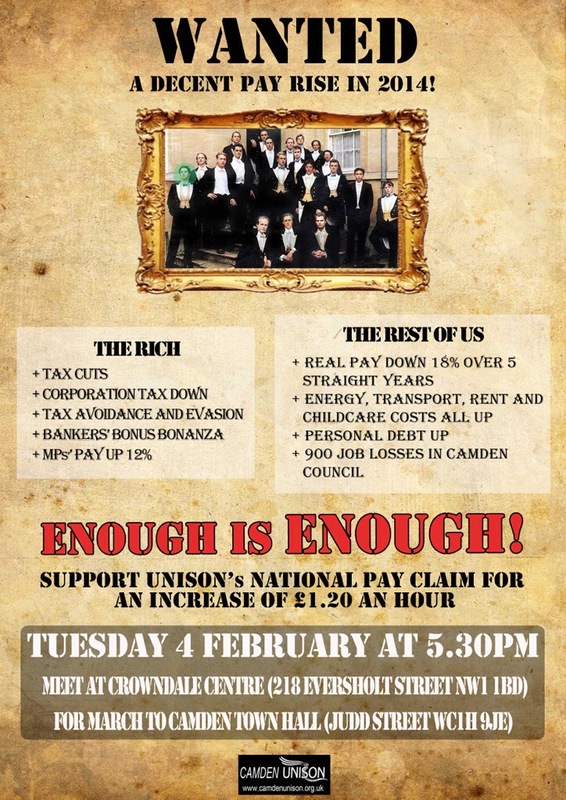 Camden UNISON, with the backing of Camden Trades Council, has called a protest march from 5.30 PM on Tuesday 4 February to highlight the union’s demand for an end to the erosion of council workers’ real pay. The call for a real pay rise comes after five years that have seen the typical value of real wages fall by 18% for the majority of council workers, even as tens of thousands of jobs in local authorities have disappeared in local authorities across Britain. In Camden alone the Council has axed more than 900 posts in the past four years, with nearly 700 staff made redundant, mainly on a compulsory basis. The Camden demonstration forms part of a national day of action, called by UNISON across England and Wales to boost its 2014 pay campaign, following a below inflation rise of just 1% for local government staff in 2013 and three consecutive years of an absolute pay freeze for hundreds of thousands of council workers prior to that. UNISON’s national welfare fund (There for You) has received a record number of applications in the past two years, paying out more than £1m to members, who are increasingly seeking help to meet rent or mortgage payments, or the weekly food bill. Local Fire Brigades Union (FBU) members will be joining the march, while the FBU’s London region has pledged financial support in the wake of the closure of 10 fire stations across the capital and the loss of more than 550 firefighters’ jobs in early January. Both the Camden and Islington branches of the National Union of Teachers are also backing the protest midst their ongoing battle with Education Secretary Michael Gove, while the civil service PCS trade union branch at HMRC Euston Tower has pledged its backing. By coincidence, the Camden march coincides with the first day of a 48-hour strike by the RMT and TSSA unions over ticket office closures and some 950 job losses across London’s Tube network. It also comes just two days before the third day of coordinated strike action on 6 February in a national pay dispute involving members of three unions representing both lecturers (UCU) and support staff (UNISON and Unite) pointing to mounting discontent with the continued assault on the public sector and its workforce. The Camden demonstration is assembling outside the Crowndale Centre, 218 Eversholt Street, NW1 1BD from 5.30 PM on Tuesday 4 February at 5.30 PM, proceeding to a rally outside Camden Town Hall, Judd Street, WC1H 9JE. In addition a double-decker ‘battle bus’ will be touring the borough from approximately 1.00 PM that afternoon. For further information, please contact George Binette, UNISON Branch Secretary, on the telephone number above or on 07557 563044/07905 826304. 1. Camden UNISON is the largest recognised trade union in Camden Council with over 3,000 members among local authority employees, on outsourced Council contracts and in the voluntary sector. It has recently launched a recruitment drive among school canteen workers employed by the private contractor Caterlink around the demand for the London Living Wage. 2. The London Living Wage (LLW) is calculated on behalf of the Greater London Authority and Mayor of London’s office, though lacks a statutory footing. After an announcement last November it was set to rise to £8.80 an hour from this April – nearly £2.50 above the current National Minimum Wage (NMW) of £6.31 an hour. Camden Council’s Cabinet agreed to move towards the implementation of LLW for workers on outsourced contracts on 18 July 2012. The Council’s ruling Labour group has introduced LLW as a minimum for all direct Council employees, but the proposed timetable for implementation on outsourced contracts extends to 2017. Meanwhile, workers employed on contracts by the likes of Caterlink and Danish-based multinational are on rates at or barely above the NMW. The estimated Living Wage for the rest of the country will rise to £7.45 an hour from April. 3. Alongside the other recognised unions representing local government workers across England and Wales UNISON has lodged a flat rate claim across all grades that equates to an increase of approximately £1.20 an hour that will ensure that the Living Wage becomes the minimum standard for all local government workers. 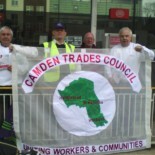 This entry was posted on January 27, 2014 by CAMDEN TRADES COUNCIL.